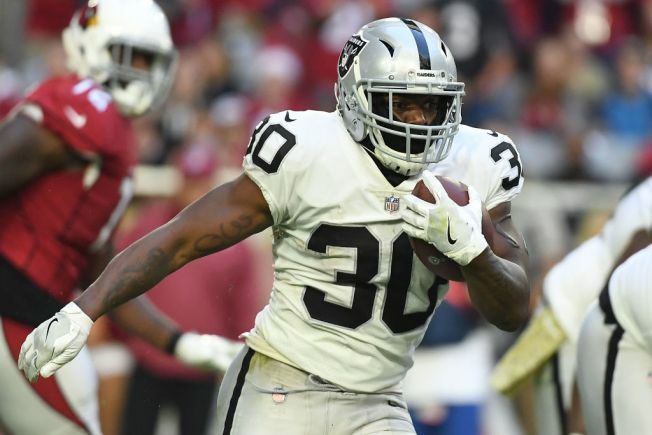 The Raiders’ running back corps still has some question marks over it, but the team has erased one variable by re-signing Jalen Richard. Oakland is projected to select a running back in the upcoming draft who might be the team’s primary ballcarrier in 2019 to replace Marshawn Lynch, should he decide not to come back (his contract has expired and he is contemplating retirement). So, for the time being, the Raiders are still in the market for a No. 1 back. But the return of the 5-foot-8 Richard, who was a restricted free agent, is good news for the offense. In 2018, head coach Jon Gruden said Richard “might be the MVP of our team” for his varied contributions. Richard has developed into a strong receiver for quarterback Derek Carr. In 2018, Richard played all 16 games and had career highs in catches (68) and receiving yards (607) while also rushing for 259 yards on 55 carries. Over three seasons with the Raiders, Richard has been a big-play threat (he had runs of 75 and 52 yards his first two seasons). He’s averaged 5.3 yards per carry on 194 attempts since 2016 and 8.5 yards on 124 receptions. He’s also returned 62 punts for a 7.5 yard average and 25 kickoffs for 19.7 yards. According to the San Francisco Chronicle, Richard received a $3.095 million deal from the Raiders for the 2019 season. Richard will be part of a backfield group that includes Isaiah Crowell, DeAndre Washington and Chris Warren III, who was impressive last exhibition season but missed the regular season with an injury.